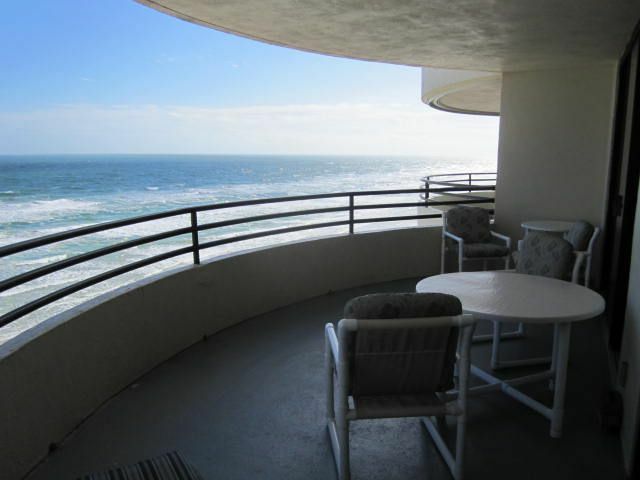 Your Daytona Beach Florida Dream Vacation is here, located directly on the beach of Daytona Beach, Florida. This condo is on the 9th floor and has 2 bedrooms 2 baths that sleeps 6. There is a king size bed and a 35" TV in the master bedroom (which includes a private bathroom). The guest room has a queen bed and a bathroom. There is a queen size sleeper in the living room plus a 40" TV, DVD, & stereo. The kitchen is fully equipped for any size meal you would wish to make. For your convenience there is a washer & dryer in the condo unit. Your balcony over looks the ocean. The heated pool & hot tub are located on the ocean front deck. You have underground parking. Your condo is within walking distance to grocery stores, banks, and many restaurants. Our names are Mike and Linda we have owned this condo since 2002. Mike and I are from Columbus Ohio, we have been married for 39 years. We have 2 grown boys that have really enjoyed coming to Daytona, they still have fun coming to the condo after all of these years!!!!! Our family has been coming to Daytona for over 25 years, so finally in 2002 we decided to buy a condo so we could go to Florida more than once a year. We try and go to the condo 3 or 4 times a year, so we can keep the condo in great shape for our renters. (also to lay on the beautiful beach!!) We love the Sand Dollar because it is fun for the family!!!!! There is also so much to do in the area. You have a washer and dryer in the unit no need going the a laundry mat!!!! If you have 2 cars or have a large vehicle there is parking for that also. You have access to the work out room. You will need to get the key from the office manager. Your kitchen has everything you would need to prepare a full dinner. If that is what you chose to do on vacation. Myself I enjoy all of the lovely restaurants and leave the cooking to the cooks!!!! The table seats 4 but there is also 2 bar stools. You can't beat the table on the balcony for a nice breakfast or dinner, the view is amazing!!!!!! You will find books in the front lobby area. We do not have a game room but we do have corn hole and shuffle broad for your enjoyment!!!! We try and have beach toys and beach chairs for the kids and the kids at heart, but unfortunately sometimes they grow feet and walk!!! We don't have bikes for your use but right across the street at the Blue Surf you can rent them there. We have a water sports rental store right across the street from our building. It is called the Blue Surf they are very nice!! Saunas are located in the bathrooms on the main level going out to the pool area. Nice clean place, great views and location, Linda and Troy great to work with. The unit was very nice. Felt like home away from home. and relaxing condo, the view of the ocean and the décor in the unit made are trip. We had a great week staying at this condo. Loved to be able to sit on the balcony morning noon and night and just watch and listen to the ocean. The kids loved to see the dolphins every day. The condo was well maintained and made it feel like we were right at home. We loved staying at this condo. THANKS!!! Very nice and clean, wonderful condo. My family enjoyed our week extremely well. We have stayed here before and we loved it. We loved it this time as well. All that you need is right here. The Condo is in a good location to all the places we like to go as well. We will definitely be back!